Small galaxy was producing stars only 425 million years after the Big Bang. 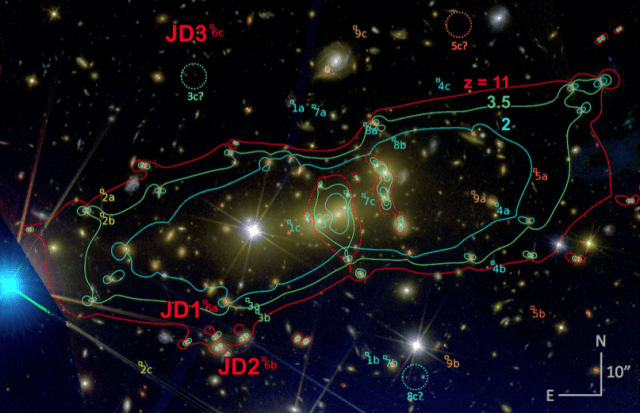 The contours of the gravitational lens (colored lines) along with the three images of the distant background galaxy (JD1-3). From: CLASH: Three Strongly Lensed Images of a Candidate z ~ 11 Galaxy, Dan Coe et. al. The Universe’s first galaxies played a key role in shaping the environment in which we now find ourselves. They fostered the formation of the first stars, which died in spectacular explosions that enabled a new generation of smaller stars, orbited by rockier planets. And the galaxies themselves merged and grew, forming the large galaxies and clusters that populate the Universe today. But, despite their critical role in shaping the Universe, we’ve never actually been able to see one of them. Slowly, that’s changing. The Hubble Deep Field exposures have helped us spot galaxies from the Universe’s early days. But now, a special Hubble project has used an intervening cluster of galaxies as a lens to spot what appears to be the most distant galaxy ever imaged, one that dates from just 425 million years after the Big Bang. Since it takes light time to reach us from distant corners of the Universe, the further you look, the older the objects you see. The wavelength of the light also gets shifted towards the red by the expansion of the Universe, which stretches it out as it travels. As you get closer to the Big Bang, light that started out in the UV end of the spectrum gets pushed deeper and deeper into the infrared. To make these galaxies even harder to spot, the extreme distance means that very few photons actually make their way to Earth, so these objects are incredibly dim. ScienceDaily (Aug. 22, 2012) — Research presented Aug. 23, 2012 at the International Astronomical Union General Assembly in Beijing has found the first group of galaxies that is just like ours, a rare sight in the local Universe. The Milky Way is a fairly typical galaxy on its own, but when paired with its close neighbours — the Magellanic Clouds — it is very rare, and could have been one of a kind, until a survey of our local Universe found another two examples just like us. Astronomer Dr Aaron Robotham, jointly from the University of Western Australia node of the International Centre for Radio Astronomy Research (ICRAR) and the University of St Andrews in Scotland, searched for groups of galaxies similar to ours in the most detailed map of the local Universe yet, the Galaxy and Mass Assembly survey (GAMA). “We’ve never found another galaxy system like the Milky Way before, which is not surprising considering how hard they are to spot! It’s only recently become possible to do the type of analysis that lets us find similar groups,” says Dr Robotham. ScienceDaily (Aug. 13, 2012) — Experiments using heavy ions at CERN’s Large Hadron Collider (LHC) are advancing understanding of the primordial Universe. The ALICE, ATLAS and CMS collaborations have made new measurements of the kind of matter that probably existed in the first instants of the Universe. They will present their latest results at the 2012 Quark Matter conference, which starts August 13 in Washington DC. The new findings are based mainly on the four-week LHC run with lead ions in 2011, during which the experiments collected 20 times more data than in 2010. Just after the Big Bang, quarks and gluons — basic building blocks of matter — were not confined inside composite particles such as protons and neutrons, as they are today. Instead, they moved freely in a state of matter known as ‘quark-gluon plasma’. Collisions of lead ions in the LHC, the world’s most powerful particle accelerator, recreate for a fleeting moment conditions similar to those of the early Universe. By examining a billion or so of these collisions, the experiments have been able to make more precise measurements of the properties of matter under these extreme conditions. “The field of heavy-ion physics is crucial for probing the properties of matter in the primordial Universe, one of the key questions of fundamental physics that the LHC and its experiments are designed to address. It illustrates how in addition to the investigation of the recently discovered Higgs-like boson, physicists at the LHC are studying many other important phenomena in both proton-proton and lead-lead collisions,” said CERN Director General Rolf Heuer. Neutrons Escaping to a Parallel World? ScienceDaily (June 15, 2012) — In a paper recently published in European Physical Journal (EPJ) C, researchers hypothesised the existence of mirror particles to explain the anomalous loss of neutrons observed experimentally. The existence of such mirror matter had been suggested in various scientific contexts some time ago, including the search for suitable dark matter candidates. Theoretical physicists Zurab Berezhiani and Fabrizio Nesti from the University of l’Aquila, Italy, reanalysed the experimental data obtained by the research group of Anatoly Serebrov at the Institut Laue-Langevin, France. It showed that the loss rate of very slow free neutrons appeared to depend on the direction and strength of the magnetic field applied. This anomaly could not be explained by known physics. Berezhiani believes it could be interpreted in the light of a hypothetical parallel world consisting of mirror particles. Each neutron would have the ability to transition into its invisible mirror twin, and back, oscillating from one world to the other. The probability of such a transition happening was predicted to be sensitive to the presence of magnetic fields, and could therefore be detected experimentally. ‘The highest thing you can be is unconditional love. This term has been used and misused in so many ways that it has more or less lost its meaning. Of course, it has nothing to do with a man loving a woman or vice versa, although that’s a smaller part of it. Unconditional love is a state of being, i.e. PURE SPIRIT. It’s our natural state. Everything else is illusion or arbitrary. (PhysOrg.com) — Many ideas in theoretical physics involve extra dimensions, but the possibility that the universe has only two dimensions could also have surprising implications. The idea is that space on the ultra-small Planck scale is two-dimensional, and the third dimension is inextricably linked with time. If this is the case, then our three-dimensional universe is nothing more than a hologram of a two-dimensional universe. This idea of the holographic universe is not new, but physicists at Fermilab are now designing an experiment to test the idea. Fermilab particle astrophysicist Craig Hogan and others are building a holographic interferometer, or “holometer,” in an attempt to detect the noise inherent in spacetime, which would reveal the ultimate maximum frequency limit imposed by nature. As Hogan explains in a recent issue of Fermilab’s symmetry magazine, the holometer will be “the most sensitive measurement ever made of spacetime itself.” Hogan and others have already built a one-meter-long prototype of the instrument. They have just begun building the entire 40-meter-long holometer and plan to start collecting data next year. The holometer consists of two completely separate interferometers positioned on top of one other. In each interferometer, a light beam is split into two different parts that travel in different directions. After bouncing off a mirror, the light beams are brought back together where the difference in their phases is measured. Even the smallest vibration will interfere with the light’s frequency during its travels and cause the two light beams to be out of sync. While interferometers have been used for more than 100 years, the key to the holometer is achieving extreme precision at high frequencies. The scientists say that the holometer will be seven orders of magnitude more precise than any atomic clock in existence over very short time intervals. By having two interferometers, the researchers can compare them to confirm measurements. In addition, the scientists are making sure that any vibration that is detected isn’t coming from the holometer itself. They will arrange sensors outside the holometer to detect normal vibrations, and then cancel these vibrations by shaking the mirrors at the same frequency. After taking these precautions, any detected high-frequency noise could be the jitter of spacetime itself, or “holographic noise.” The noise is expected to have a frequency of a million cycles per second, which is a thousand times higher than what the human ear can hear, noted Fermilab experimental physicist Aaron Chou. If the experiment does find this holographic noise, it would be the first glimpse beyond our three-dimensional illusion and into the universe’s true two-dimensional nature at the Planck scale.